As you may have seen on our social media, we have been dedicating our time to making a whole new website! Before Christmas, this website will be transitioning over to our new page. At the request for more frequent blogs so we have decided to do a few more, just for you. This morning we want to celebrate Autumn and the approach to Christmas. We are doing this, with a blog about how to sweeten your drinks up using a tasty syrup! This blog will give you a few ideas hopefully. Autumn is the season to spruce up your hot drinks with that added touch of syrup. 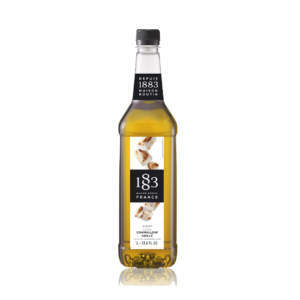 Here at Pollards we stock Routin 1883 flavouring syrups. These are the best syrups around and are available in a huge variety of flavours. You could try a new one every day and find one that suits you to a T.. or coffee. Pollards stock and supply the whole range of Routin syrups that compliment both tea and coffee hot beverages. Some are available online to buy now, or call us for more options on 0114 261 7517. Routin offer premium quality natural syrups which are presented in sturdy and attractively-shaped glass bottles, making them ideal for front of house display where image is important. Available in different sizes from miniature sample sized to wholesale bulk sizes. These syrups are suitable for the home coffee drinker to the cafe, small business or restaurant. Routin has been producing natural syrups for flavouring drinks and cream for over 100 years and are now the world-leader. They only use natural ingredients and traditional processes (no artificial flavours). The flavours and colours are all natural extracts mixed with sugar and pure water from the Alps… nothing else! We love it. For Autumn you can add some Pumpkin Spice syrup to your latte. Try Marshmallow syrup with your Pollards hot chocolate. The traditional caramel latte is just perfect. And a Cinnamon twist adds that taste of Christmas. All of these flavours can be achieved with a Routin 1883 syrup supplied by Pollards, Sheffield. 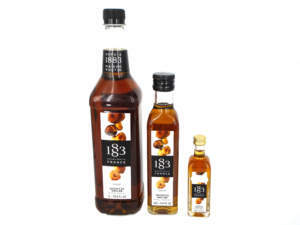 We are proud to be a local supplier of Routin 1883 syrups. Let us know what recipes you like with your Routin Syrup and Pollards Coffee, and get in touch to place your order with us. Wholesale bulk pricing is available and we can supply you with everything you need for your coffee this season.